Nottinghamshire’s second most widespread bat is easy to identify with ears nearly as long as its body. The majority of summer roosts are found in old buildings with large roof spaces. They are a very quiet bat and are difficult to pick up on a detector, which is why they are also known as whispering bats. 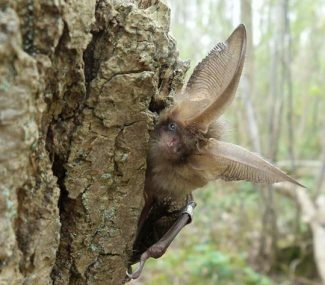 Long-eared bats can use their large ears to hear the sounds of insects on a leaf which they then glean from its surface. They will also take prey from the ground. Their catch is often taken to a feeding site which can give away its location by the quantity of moth wings and other insect remains found below it. Their winter quarters are in a variety of locations including buildings, tunnels, ice houses and caves. Brown long-eared bats produce very quiet calls and often go undetected. They are however easier to hear if you have your detector pointed at a roost access. Their calls are short, 1.3ms to about 3.5ms, and on a heterodyne detector sound like rapid clicks. The frequency of maximum energy is around 39-40 kHz and there is often a cleat harmonic (see sonogram below). The calls on this page were recorded in September 2010 at the entrance to a roost of about 35 bats. Recordings were also made within the roost space. Time expansion (10x) recording of a brown long-eared bat leaving the roost. Time expansion (10x) recording of four brown long-eared bats inside the roost space. Heterodyne recording (detector set at 40kHz) of up to four brown long-eared bats inside the roost space. Some social calls can be heard.